Say “Ernie Ball” to most guitarists, and we’re betting what goes off in their heads is some favorite crazed string-bending riff. Ernie Ball—the man and the company that bears his name—have become synonymous with guitar and bass strings that sound and play…well, slinky! In this guide we’ll walk you through our universe of electric, acoustic and bass guitar strings. We’ll look at the sonic signatures and performance characteristics of each string type. 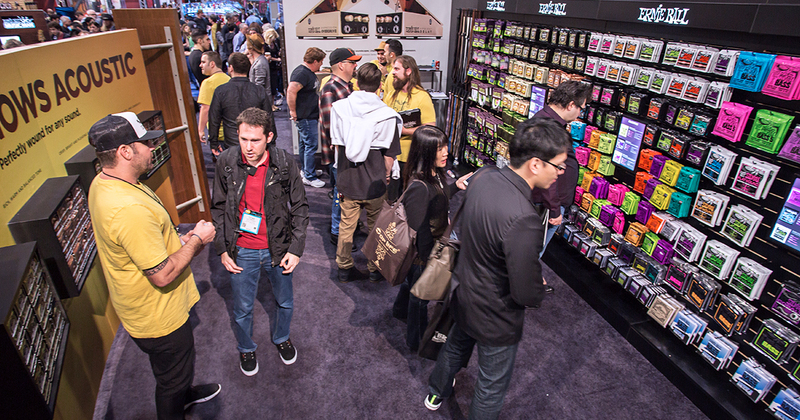 We’ll also touch on the artists who play our strings and have become an intimate part of the Ernie Ball story. The Ernie Ball tent is a big one—big enough to house a dizzying array of guitarists drawn from every corner of the music universe. One look at the roster of musicians who play Ernie Ball confirms that. Rock’s founding fathers like Jimmy Page, Eric Clapton, and Keith Richards as well as countless emerging and indie acts in every genre depend on Ernie Ball strings to carve out their signature sounds. As an L.A. multi-instrumentalist and owner of what many consider to be the first guitar-only music shop, Ernie Ball brought the player’s perspective into focus in the early 1960s, just as modern rock was gathering force. Seeing students struggling to play the relatively heavy-gauge guitar string sets of the day, he began having custom, lighter-gauge sets made to order. These sets, which Ball dubbed “Slinkys,” caught on with pro musicians like Merle Travis, The Ventures, and The Beach Boys, and he was soon getting mail orders from music stores and players all over the country. Seeing the writing on the wall, Ernie Ball began producing his strings in-house, creating a constantly expanding assortment of strings based on musician feedback and lots of R&D. With international distribution by the early 1970s, Slinkys quickly blew up into the world’s most demanded strings. With devotees including Jimi Hendrix and Pete Townshend helping to spread the Slinky gospel, the die was cast. Since then, the Ball family has continued to follow Ernie’s lead by listening closely to what guitarists want. Development of innovative materials and methods have kept the Ernie Ball juggernaut rolling into the 21st century. Whether you play classic rock, blues, metal, country, or punk, a new set of Ernie Ball electric guitar strings can help you and your guitar sound its best. With more than 200 options including a wealth of gauge, style and material choices, experimentation should produce the ideal string for your sound. Let’s take a look at our top-selling string sets. Some people say you need “golden ears” to detect much difference between strings. Steve Vai was among them. He changed his tune after trying out a set of Cobalt Slinkys. The cobalt component in the winding alloy produces higher output with greater definition and is ideal for any energy-intensive music like punk, metal, hard rock or blues. Their clarity can help you cut through the dense sonic onslaught of bass and drums. Explore the full range of Ernie Ball Cobalt Slinky electric guitar strings. A great choice for overall tonal balance—not too bright or dark—Nickel Wound Slinkys include a huge range of options. You’ll find sets for 7-, 8-, 9-, and 12-string guitars as well as 10-string sets for pedal steel. Other options include Beefy and Power Slinkys as well as baritone guitar sets. With near-endless gauge options, we’ve got your guitar’s ultimate setup covered. The ‘M’ in M-Steel stands for maraging steel—a defense-grade superalloy known for its extreme durability and fatigue strength. Ernie Ball M-Steels are wrapped with Super Cobalt alloy over a maraging steel hex core for a high-output signal with commanding low-end response. The super-durable M-Steel lineup includes Power, Regular, Super, and Hybrid Slinkys. There’s also a Skinny Top/Heavy Bottom set for players who want the heavy rhythm chunk of thick strings combined with solo-friendly lighter gauges on the plain strings. Check out the complete M-Steel Slinky line—the common denominator is traditional Slinky playing comfort and awesome durability. A former Nickel Slinky player, John Petrucci considers M-Steel Slinkys an evolutionary step ahead for their smooth top and punishing bottom that serves his heavy approach. If you tend to dig into your strings and experience frequent breaking and slipping, a set of RPS Slinkys is the fix. RPS Plain Strings use a brass wire winding at the lock twist of the ball end that solves both these issues while delivering trademark playability. Keith Richards is a notable RPS fan. Our Coated Titanium RPS string sets have a proprietary nanotreatment on wound strings and titanium reinforcement on the plain strings for maximum longevity and better tuning stability. For the purist chasing down classic retro guitar tone, Pure Nickel Slinkys make a great fit. Their warm, round tone and harmonic complexity at the front end of your all-tube signal chain will help you conjure up classic blues, rock and R&B sounds. There’s a complete lineup that includes Extra, Super, Hybrid, Regular, and Power Slinkys in the Pure Nickel lineup. The Stainless Steel Slinky marries our trademark feel with the decidedly bright attack and shimmer stainless steel brings to the game. They’re also mighty tough. You’ll find an extensive lineup of Stainless Steel Slinkys in Extra, Super, Hybrid, Regular and Power, string packs as well as an E9 tuning set for pedal steel. Acoustic guitars present different challenges than their electrified cousins to the string maker. Ernie Ball rises to those challenges with a robust collection of acoustic string lines that have won over a broad range of artists including Paul McCartney, Jimmy Page and Dierks Bentley to name just three. To give you maximum choices in shaping a signature acoustic guitar sound, we have a broad and deep selection that includes Aluminum Bronze, Earthwood 80/20 Bronze, Everlast Coated Phosphor Bronze, Phosphor Bronze Acoustic Slinky, Everlast Coated 80/20 Bronze, and Ernesto Palla Nylon Classical strings. And we haven’t forgotten about mandolin and banjo players either. Our Stainless Steel strings for mandolin and banjo get consistently high marks from players. As you zero in on the best gauges for your guitar, the age, neck bracing and condition of your instrument should be considered. It’s generally safest to err in favor of lighter gauges on older acoustics. Also, though they may not have quite the punch of medium or heavy strings, light-gauge sets are usually recommended for newer guitarists. Ernie Ball’s relationship with the bass go way back. Working alongside legend Leo Fender he helped reshape the bass guitar to the realities of modern music’s sonic and performance demands. The Music Man collection of basses and guitars boasts a stellar artist lineup that includes bassists like Paul McCartney, Tony Levin and Mark Hoppus. With more than 100 different choices and string packs designed for 4-, 5-, and 6-string bass plus long-scale and ⅝-scale bass options, Ernie Ball produces the right string for your bass and music. Our best-selling roundwound bass strings have a bright, articulate, “poppy” tone ideal for funk and crisp rock bass. Ernie Ball flatwound bass strings are preferred by jazz, reggae and country bassists for their more rounded, mellow tone and softer attack. As with our acoustic and electric guitar strings, our line of bass guitar strings is extensive. You can choose from Flat Wound, Slinky Flatwound, Coated Electric, Nickel Wound, Stainless Steel, Cobalt and Earthwood Acoustic Bass strings. We hope you find this guide helpful in sorting through all the options. Once you’ve honed in on a set to try, use our Store Locator to find a local dealer.